Have you considered trade schools? We’ve said it before and we’ll say it again—the traditional four-year college experience isn’t for everyone. If you love to work with your hands, why not consider trade school instead? 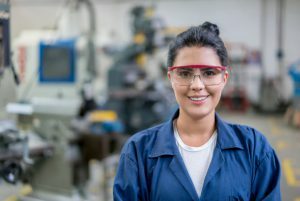 Also known as technical, career, or vocational school, a trade school is defined by PrepScholar as “a post-secondary institution that’s designed to give students the technical skills to prepare them for a specific occupation.” They frequently offer two-year programs and cost much less than the traditional four-year college experience. Trade schools are open to all students with high-school diplomas or GEDs, regardless of age. This makes them a perfect option for both fresh high-school grads or those looking to make a career change later in life. But what about career options? Is it possible to make a good amount of money with a trade school degree? Yes it is. And here are some options to prove it, courtesy of Trade-Schools.net and the Bureau of Labor Statistics. Dental hygienists clean teeth. They keep an eye out for tooth or gum problems and support the dentist in several ways, including taking notes and data input. They’re also available to answer general dental health questions. Electricians are unsurprisingly the experts of all things electrical. This means installing, maintaining, and fixing electrical wiring, equipment, and fixtures in buildings. They can work in homes, businesses, warehouses, and anywhere else with electrical wiring. Some jobs can be outdoor, while others are indoor. Heavy equipment operators, also known as construction equipment operators, drive or operate heavy machinery. If you’ve ever wanted to embrace your childhood dreams of driving heavy construction vehicles, you might consider this position. Equipment used includes excavators, wrecking balls, and all sorts of other hulking vehicles. They use this equipment to build everything from roads and bridges to buildings and more. If you care for others and want to help them stay healthy, consider a job in nursing. A licensed practical or vocational nurse does not need a degree. These nurses provide basic care while working under registered nurses and doctors. Job environments can vary, from nursing homes and hospitals to physician’s offices and even private homes. Looking for further information on other job types? Check out our Job Spotlight blog series. Do you have one of these jobs? Are you interested in one? Let us know in the comments below! Previous Post Can You Be Friends with Your Coworkers? Next Post Poll Question: Help Us Rename the Blog!